Oh how I wish that I could bring my pups on all my trips. Imagine taking photos with your fur babies a top the Eiffel Tower or on the beach in Mykonos. Unfortunately, that isn’t really an option for some. Especially if you live where I live, there are some crazy restrictions. But if you have a service animal, traveling domestically within the U.S. is usually easy peasy. I for one have no issues flying next to animals (dogs, cats, etc). I mean let’s be very honest here, pets are easier to be around than some children. Have you ever been on a 6 hour flight with a child that would not stop crying? “Beginning in March, Delta Airlines will be asking passengers flying with service animals in the cabin to sign a statement that their animal is healthy and well-behaved before they can board a flight. Now I get it. 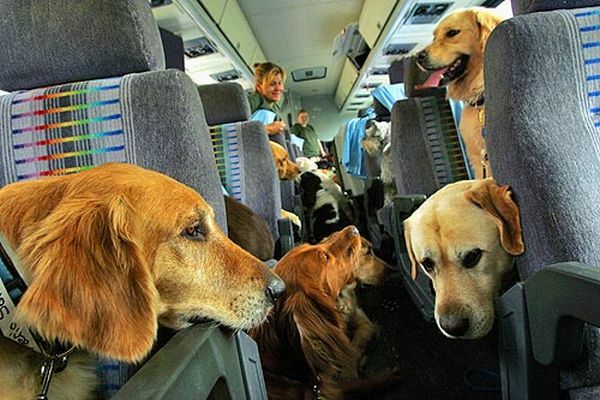 Misbehaved animals are no fun and can be a hazard to other passengers. The thing I wonder about though is what constitutes healthy and what does it mean to be “well-behaved?” Most people take their pets to the vet once a year, so what does it mean to be healthy? Do you need a full on exam with rounds of tests to ensure that they are? And being well-behaved, well let’s be honest here, even parents to human children have their own definition of what it means to behave. The Animal Legal Defense Fund has maintained in public warnings over years that cargo holds are unsafe for pets, and to fly with pets in the cabin whenever possible. The latest animal incident report, submitted to the Department of Transportation earlier this month, shows that United Airlines and Delta have the highest numbers of reported animal deaths since 2005, a respective 86 and 84 in total. Delta’s two most recent animal deaths occurred last August. Last year, after a woman accused United Airlines of killing her dog that was shipped via cargo, the airline told ConsumerAffairs that the incident was not included in its government-mandated death tally because the animal was alive when it got off the plane. The dog did not die until his owner drove him to the vet’s office later that day. I think we need to come up with better solutions for transporting our fur kids. The pet industry is valued at over $60 billion in the United States alone and shows that pets are family (or really are our children). You wouldn’t just throw your family in cargo would you? How do you feel about this? What alternative solutions do you think the airlines could come up with to enable ALL pets to fly and to safely get to their destination?